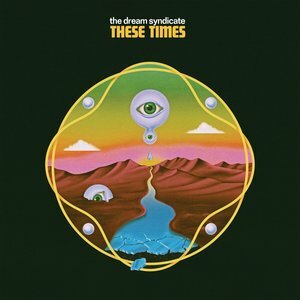 The Dream Syndicate's latest album, These Times, is a statement from a veteran band that finds itself pushing forward into new territory. Not content to deliver The Days of Wine and Roses 2019 Steve Wynn, Dennis Duck, Jason Victor, and Mark Walton have emerged with a vibrant collection of songs that ranks among the best the veteran group has recorded. This is not a band competing with its past but instead carving out a bold new future. Songs such as "Bullet Holes", "Black Light", and "Put Some Miles On" seem destined to become Dream Syndicate classics. Wynn, an affable conversationalist, is keen to focus on the group's next ventures. This spring saw the group open dates for Mott the Hoople on the British acts first string of dates since 1974 (the last band to open for Ian Hunter and Co. on American stages was Queen) along with headlining dates. "We'd like to play with some younger bands, too," Wynn says. "There are acts out there who maybe aren't directly influenced by us but you can hear some similarities." He adds that he has a fondness for the sonics of Ty Segall and Thee Oh Sees. Speaking from his home in New York City, which he shares with his wife, drummer Linda Pitmon (Steve Wynn and the Miracle 3, the Baseball Project, the Pretty Babies), Wynn provided PopMatters with a view of where the Dream Syndicate is at the moment and where it may go next. Did you know after the making of 2017's How Did I Find Myself Here? that you'd want to record another Dream Syndicate album? The last record was kind of a rebirth for the band. It was a little bit of a bridge to the past. It had enough referential points to who we were before but also led us to a new place. It was very liberating and exhilarating for us. We said, "we could do anything next time around." We were excited to do that as soon as we could. We followed the last album with six months of touring. Over that time, we inhabited the songs, developed our sound, got more into improvisation, more into sonic possibilities. With each day and each stop on the tour, we got a little more away from who we were in the 1980s. I feel like we share a name with a band from that decade and cover some of their songs but we're somebody else at this point. It must be great to have an audience that will follow you through those changes. You and I can probably think of bands where the fans want to keep them as something they were 30 years ago. I'm a music fan and collector and historian in my own way, like a lot of people are. I know that when bands reunite they're really threading the needle. Some bands are just a pale carbon copy of who they were. Who needs that? Some bands go so far away from who they were you have to wonder why they kept the name. I think that, on the last record, we did a really good job of getting it right. My wife often says, "don't estimate your audience." She's right. It's like a mantra. You can be surprised by how far your fans are willing to go with you. The initial reunion happened in 2012 but it was some time before you made a record. Was there some trepidation about the process? I don't think we thought that much about it. I think the reunion was really spontaneous. It was almost on a whim. "There's a festival in Spain that wants us to play. A Spanish vacation sounds nice about now." There were about three years of, "let's see what happens." At some point, "let's see what happens" became a pretty enjoyable thing that we wanted to keep going. We didn't think about making a new record after some time on the nostalgia circuit. After we'd played some of our favorite cities, we realized that we wanted to keep doing this and we also realized that we didn't want to go out and keep playing the same four albums over and over. That's when we made the last album. But even then we went into the studio without telling anybody, without a label, without hyping it on social media. We just said, "let's see if this any good." You've had many different musical projects. Is there something, when you're writing that makes you go, "Ah, this is definitely for the Dream Syndicate"? This album is called These Times. Were you in a particular mindset as you were writing the lyrics? Maybe 20 years ago, you might have picked up the morning paper and saw a headline and thought, "OK, it's good to know what's going on." Now, I think most people are paralyzed or enraptured by everything that's happening. I think that being a writer or a musician or a novelist or filmmaker, it's a real battle. To not address where the world is at is to be in denial. But if you write about anything specifically it's going to be dated within 24 hours. Without thinking too much about it, I think this record ending up reflecting the feelings right now. The feelings of anxiety and paralysis and of hope and confusion. The songs weren't intended to be a statement on that but it was there. I let them all flow. My understanding is that the band members live in different quarters. How do you prepare for sessions where there's improvisation, then? We've got one person in Los Angeles, one in Las Vegas, two in New York and one in Germany. It's not like we can just get together at our local rehearsal space and try out ideas. We're pressing record and finding out what we've got. But it's fun to do it that way. We record in a place in Richmond, Virginia, which is, fortunately, a very affordable place so we don't feel the pressure of time. It's also a comfortable, homelike place. We can start early, go late, whatever feels right. We can go down some blind alleys. It's not like we're saying "if we don't get this done by four o' clock we're done for the day." I go in like we're cooking dinner: Here's some cayenne pepper, eggplant, and three carrots. What are you going to make with that? Was there one song in particular that made you say, "A-ha! This is the new Dream Syndicate"? A lot of them. "Still Here and Now" and "Space Age" are both holdovers from the last album. I can feel the difference on those two. All the other ones really feel like new places for us. "Put Some Miles on It" feels like unlike anything we did before. But it's still us; it's repetitive, it's droning, it builds on a circle until you're in a trance from what you're hearing and what you're playing. It's still the thing we do best. Same with "The Whole World's Watching". It's a new groove but it's a groove nonetheless. How do you approach lyrics then? With this album and the last album, I had maybe no lyrics. Maybe a title, maybe one line, maybe some idea of where I wanted to go but I really went in with nothing. I don't normally work that way. Everyone's so responsive. I worried that they might hear a word or a message and try to respond to that. I didn't want to overwrite. We had a three-week break between the initial tracking and vocals. What you get is very much a reflection of where I was at in August of 2018. A band's first record often reflects the years that they've been playing clubs so the lyrics might be very disparate in terms of subject matter. The old saying is so true: You have your whole lifetime to make the first record and six months to make the next one. I spent years wondering what would happen if I got to make a record. I got to, now what the hell am I going to do? You have to decide if you're going to do it the same way or if you're going to take a bold move. Everything I've been part of does the latter. Do you take that as a point of inspiration? I think of my early days as a writer. I had no idea where it was going to take me and what the next thing would be. It was scary. Now, I don't always know what the next story is going to be, but I'm always excited to find out what it is. Exactly. That's true. With our first two or three records, there was always that feeling of, "I like doing this and I want to keep doing it but who knows if this is the last record I'll ever do?" It's very liberating to come to a point where you say, "I'm going to take chances, go out on a limb. Try things. Have fun doing it. Challenge myself." If It doesn't work out? Try it right the next time. That's something I like about making records often. You tend to think less about them. It's paralyzing when every record is five years apart. You suddenly want to encapsulate everything you've done, everything you are, re-explain yourself. With these last two records, we had more than double the material than we actually used. That gave us choices on ways to frame it, to think about what we might save for later. If you don't put the pressure on yourself to make the grand statement every time you probably make more of a grand statement. You don't have to have the epic introduction. You can start in the middle and find the story. That's true. I've been approached to write the inevitable rock memoir. I really want to do it. I think I have enough good stories. But it's kind of paralyzing because all of a sudden I start thinking, "Am I going to start it right and end it right, give the right message?" Since I've not written a book, it's taking forever. But I've made enough records that I know how to knock them out. I'm a fan of the Nick Lowe thing of bash 'em out, tart 'em up later. [Laughs.] Did you have a point where you thought, "I'm going to teach English or work as an engineer"? Starting with the second Dream Syndicate album, Medicine Show, and the tour after that, I figured, this is what I'm going to do. I've done some writing for TV and movies and some people have covered my songs. It's always a nice thing. I'll be 60 next year and I'm still learning and excited by music and still collaborating with new people all the time. What are your memories of Medicine Show? Enough to fill a book! [Laughs.] It's a record that was misunderstood at the time. In the States, there was a backlash to that record. In Europe, it was essentially our first record. People there freaked out and loved it. We were simultaneously dealing with a record being a disappointment and a revelation. Over time, it's become a staple for a lot of people. It's my favorite of the Dream Syndicate records up to these last two. Now that I've said that, it was really hard to make. We spent five months making it. We were working 12 hours a day, seven days a week. We played the same songs. There were no outtakes, no other songs. We were looking for something. We didn't know what. Our producer, Sandy Pearlman, was also looking for something. For better or worse, we had a label that would just keep paying the bills, so we kept working. It might have been a little confusing or frustrating while it was happening but it was a good record at the end. What I didn't realize at the time was that Sandy was a fan and he was trying to figure out where we'd go after Days Of Wine and Rosesas we were. What do you remember about writing "John Coltrane Stereo Blues"? It's a jam. The thing I wrote is the riff. When Kendra [Smith] was still in the band we did a radio show on KPFK. That's come out as The Day Before Wine and Roses. We had 300-4,000 people watching us do our thing late at night. I said, "Let' do a complete improv thing." I wrote that riff then and there was no other roadmap. Now? It just goes where it wants to go. It's still a thrill every night. The 3x4 record with the Bangles, the Three O' Clock, the Rain Parade, and the Dream Syndicate all covering each other's early songs is out during all of this. It's a nice document of the Paisley Underground. We played a few shows with those bands back in 2014. We had a great time hanging out. We were trying to figure out how to keep it going. We can't get those bands on the road. We've tried. It's too many people. We did that record instead. It's pure nostalgia. It was only about a year that we were hanging out and playing shows in the 1980s. But that scene had more longevity than I would have imagined. It's nice to celebrate it and hang out together which we hadn't for a long time. I love the versions people did of our songs. I think I almost like their versions of those songs better than ours!